We’ve all had posters of the 911 on our bedroom walls at one time or other. Some of us still do. 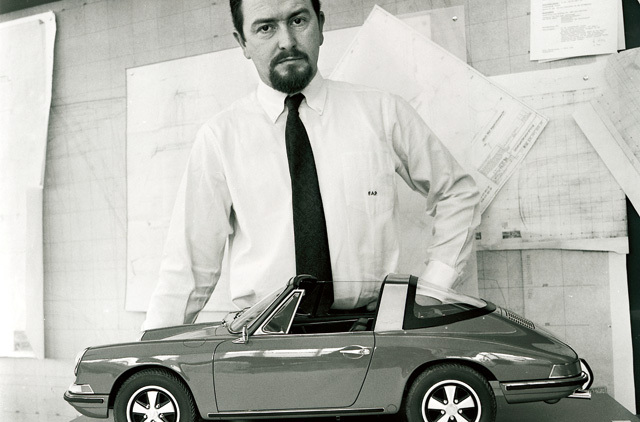 Sadly, the man who gave us that legendary sportscar, Ferdinand Alexander Porsche, grandson of the firm’s founder, passed away earlier this month at the age of 76 and the automotive world has been mourning his loss. Known as ‘Butzi’ to his colleagues, Ferdinand was born in Stuttgart on December 11, 1935. As a young boy, he’d spend much of his time at the workshop of his grandfather who created the Volkswagen Beetle in the Thirties. That’s where Butzi was bitten by the car bug. He had a happy knack of drawing and then building his own toys and after gaining his qualifications at the esteemed Ulm School of Design, he joined the family business in the late Fifties after impressing company officials by sculpting a model using plasticine of the successor to the four-cylinder 356. It was the 911, but originally, the plan was for it to be called the 901. However, a dispute with Peugeot who had already trademarked the 0 in the middle of all of its car names meant it had to be renamed to the now familiar 911. Work began to replicate a full-scale version in time for the Frankfurt motor show in 1963 and when it was unveiled, it was an instant hit. He took over the company’s design studio in the Sixties during which time, the six-cylinder 911 was widely acknowledged as the best sportscar in the world. He didn’t stop there. He also created the Type 804 Formula 1 racing car and the 904 Carrera GTS — one of the best-looking racing cars of all time. In the Seventies, he founded a classic gentlemen’s accessories firm, Porsche Design Studio, creating pens and watches and the like. He firmly believed in function over form and as a result, his designs were always simplistic in terms of looks but there was no doubting their sheer quality. During his career, he received many awards and honours, none bigger than the title of Professor bestowed upon him by the President of Austria in 1999. His long association with the company continued even after he stepped down from front-line business operations, as a member of the Supervisory Board where he helped guide the firm through economic hardships during the early Nineties. In 2005, he passed board responsibilities on to his son Oliver and instead took on the mantle of Honorary President of the Supervisory Board. Even though the 911 is now in its seventh generation, those iconic looks including that sloping roofline and round headlights remain almost exactly the same today. It says everything about Ferdinand’s vision. It’s an incontrovertible fact that his contribution to the brand has made it not only one of the richest car manufacturers on the planet, but one of the best looking and instantly recognisable too.